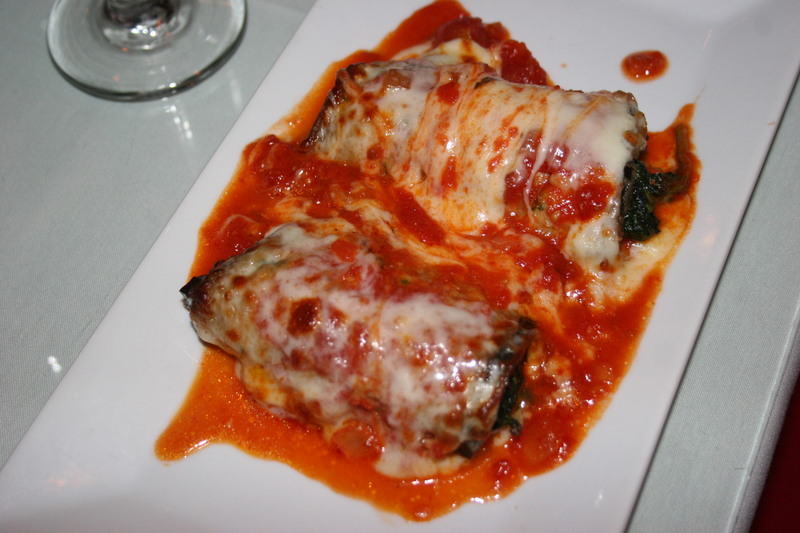 There are some restaurants that you enjoy because of the food. There are others that stand out for other reasons. Ten of us enjoyed our Saturday evening dinner at this Ventnor, NJ BYOB because the food was good and an outstanding server named Frankie Fish not only entertained us but made us feel like part of the family. 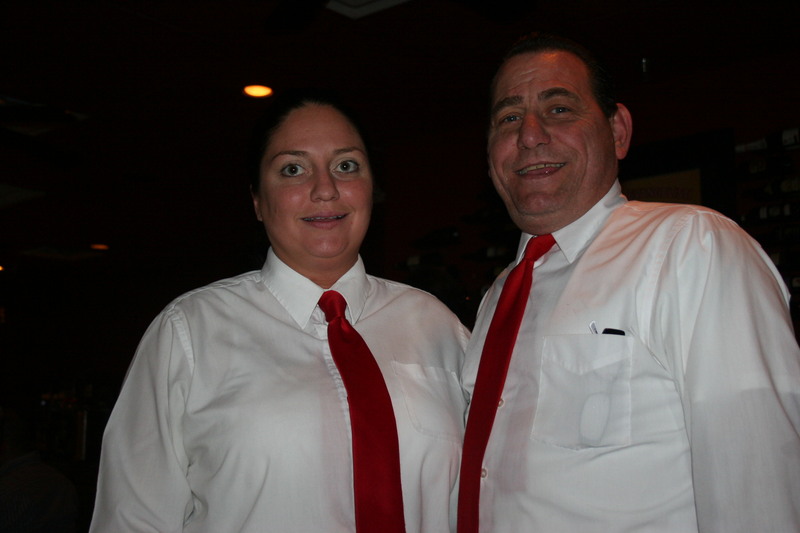 Frank and Jill made a great tandem and with all of our wines and extra glasses we kept them hopping all evening. They handled each request with skill and professionalism. It didn’t hurt that Frank does a pretty good imitation of Robert DeNiro. 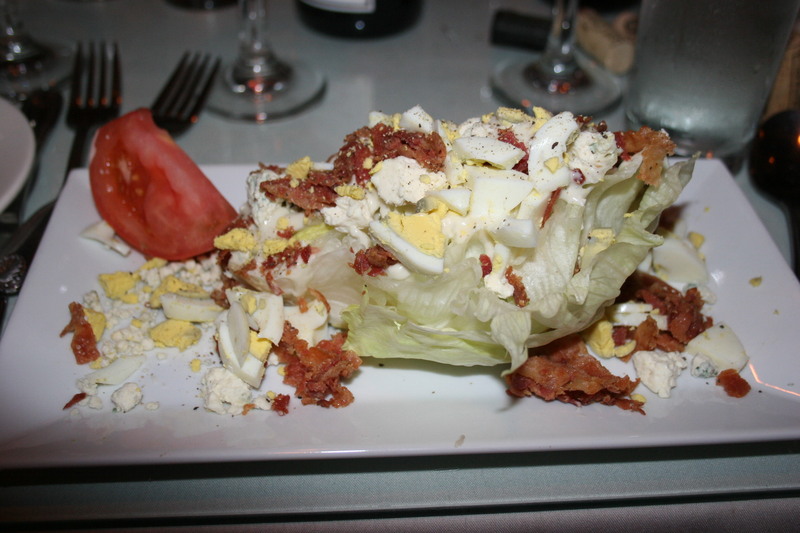 We were lucky that the Red Room Cafe had decided to extend Atlantic City Restaurant Week for a few more days and thus our three course meals including an appetizer, entree and dessert were available for the fixed price of $33.11. 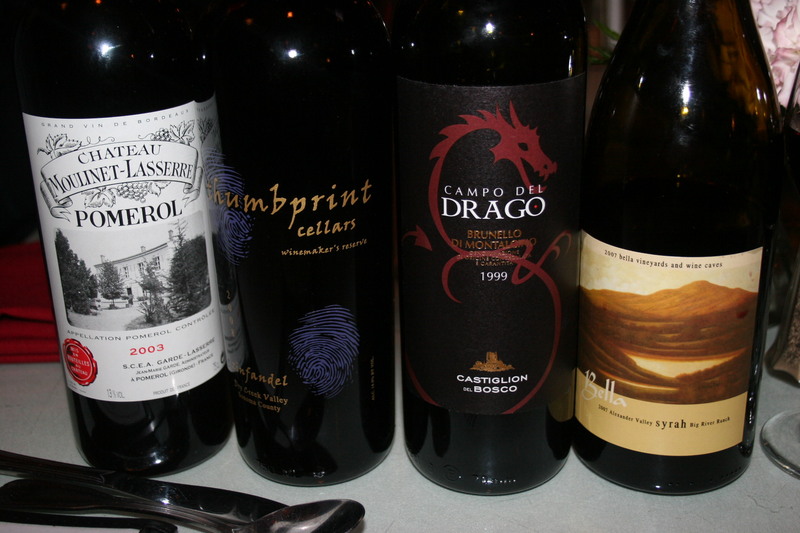 As usual, we had a nice assortment of some pretty good wines including, but not limited to, those shown here. A 2003 Chateau Molinet Lasserre, Pomerol started off the evening and was a nice solid Merlot based wine that had nice tobacco, red plum and chocolate notes with the earthy hints as well. There was also a 2008 Thumbprint Ramazotti Vineyard, Zinfandel and we always enjoy the unique wines from this California producer who we have met on both coasts. Joe B. chipped in with a very nice 1999 Castiglione del Bosco, Brunello di Montalcino, Campo del Drago. This 92 pointer from Wine Spectator took a few minutes to find itself but then the smooth flavors of crushed berries and soft tannins revealed nice hints of a well-made wine that had grown in stature during its decade in the bottle. 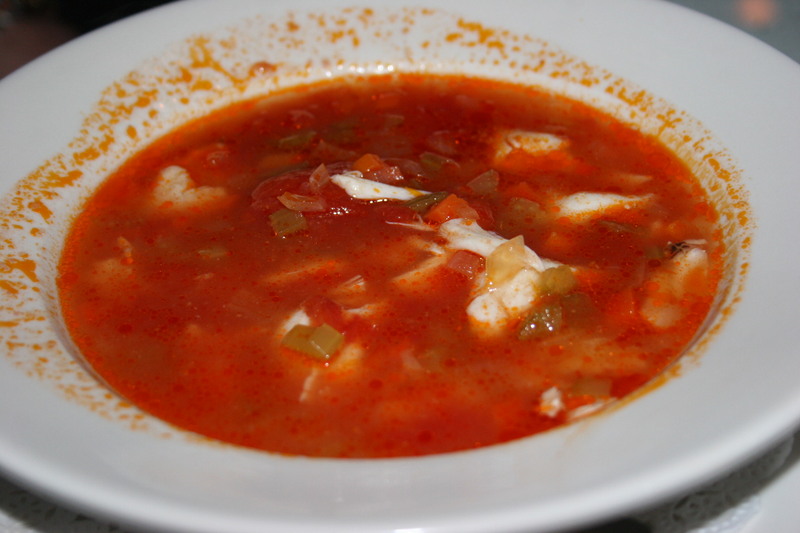 It went well with many of the dishes served. I went with a 2007 Bella Vineyards, Alexander Valley, Dry River Ranch, Syrah. Bold flavors of rich blackberry and licorice with a combination of power and finesse made this a great match for a wide range of hearty foods. Although not pictured we had a few other wines, most notable among them was a 2007 Lost Canyon, Morelli Lane Vineyard, Pinot Noir. Great nose of lilac and mint and soft flavors of ripe cherries made this wine perfect for some of the lighter meats. It would be virtually impossible to review all of the items and course that the ten of us enjoyed but I will focus on mine and a couple of others that I recall. 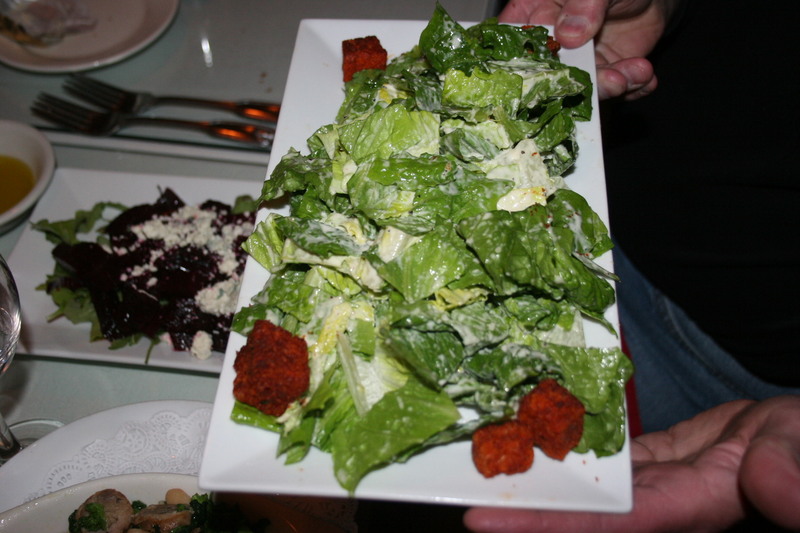 Several of our group began with salads, the House Caesar, a Roasted Beet Salad and on the right my choice of a Classic Wedge Salad with Blue Cheese dressing on the side. 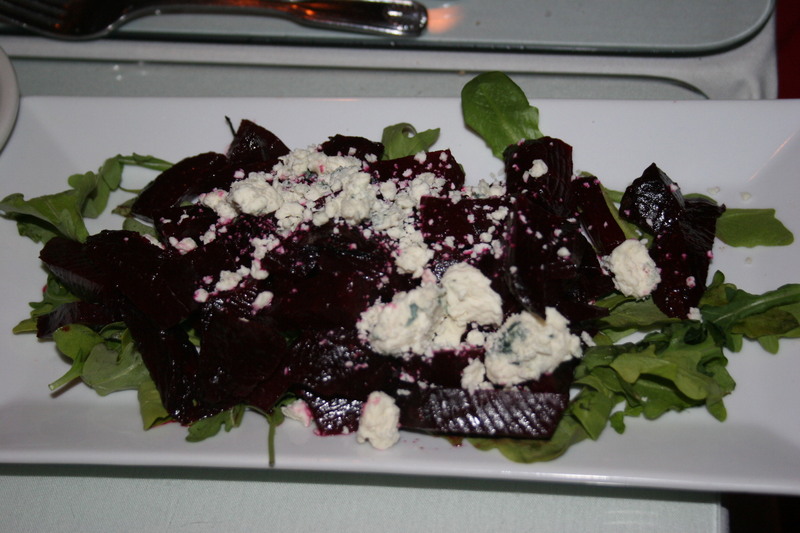 All were tasty with the beets drawing the most attention. There were lots of tempting entrees to choose from and the ten of us managed to sample quite a few. 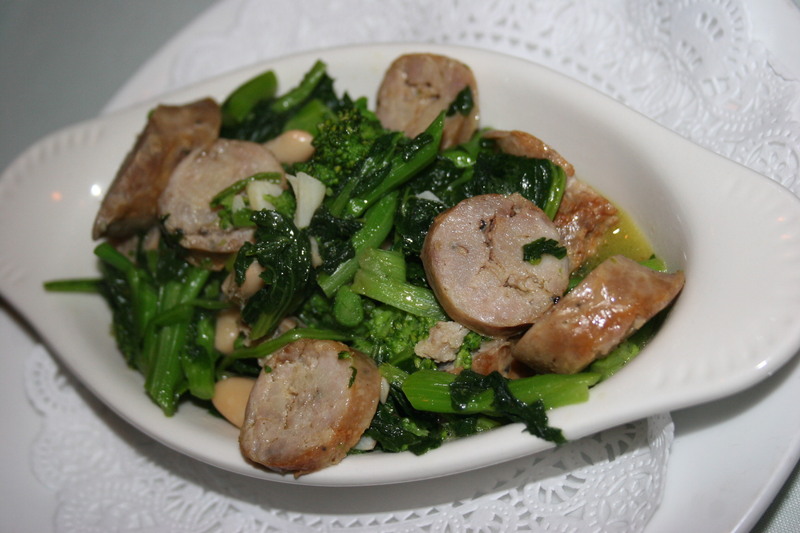 Ange and Arlene both chose the Vitello con Funghi Salavaticci, veal medallions, prosciutto and a trio of wild mushrooms sauteed in a Marsala wine and veal demi-glaze sauce. It looked great and they both totally enjoyed their selection. 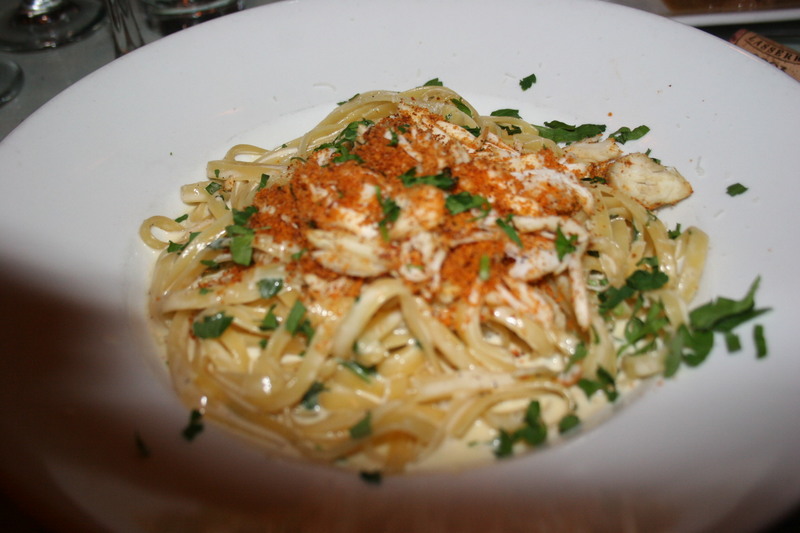 Gerry went with the Bronzino fillet served, as were most dishes, with mashed potatoes and asparagus spears, I went with the fettucine Al Rubinio, toasted jumbo lump crab meat served over a bed of fettuccine in a roasted garlic cream sauce. My dish was very good. The sauce was subtle and not overpowering. I took enough home for a Sunday lunch. 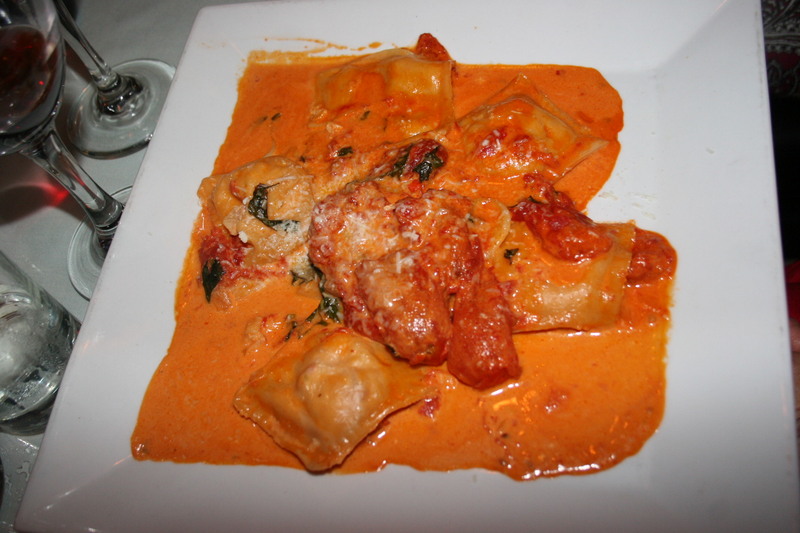 One of the ladies ordered the Ravioli Aragosta, homemade ravioli stuffed with lobster and served in a rose Cognac cream sauce and another had the Gamberi Imbottiti, jumbo shrimp stuffed with crab meat in a wine sauce. 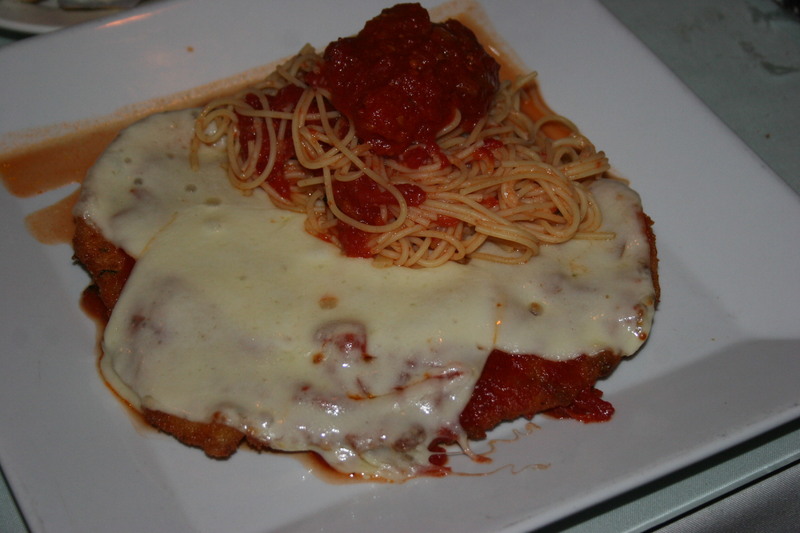 Val opted for the Pollo alla Parmagiana served over a bed of spaghetti in a rich marinara sauce. 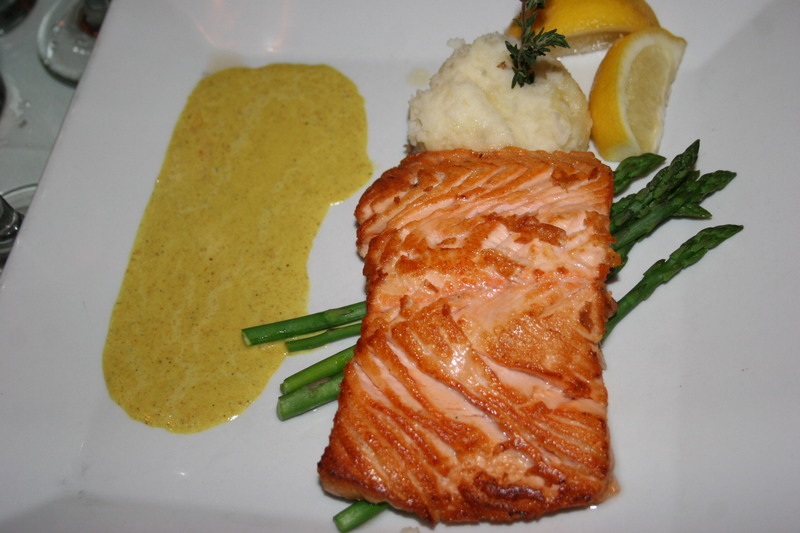 Kathy chose the Salmon with a dijon mustard sauce. Her dinner was delayed for about eight minutes and it made for some slight tension. She thought the fish was good but that the sauce lacked flavor. A common complaint amongst several in our party that although everything was fresh that the sauces and flavorings left a little to be desired. 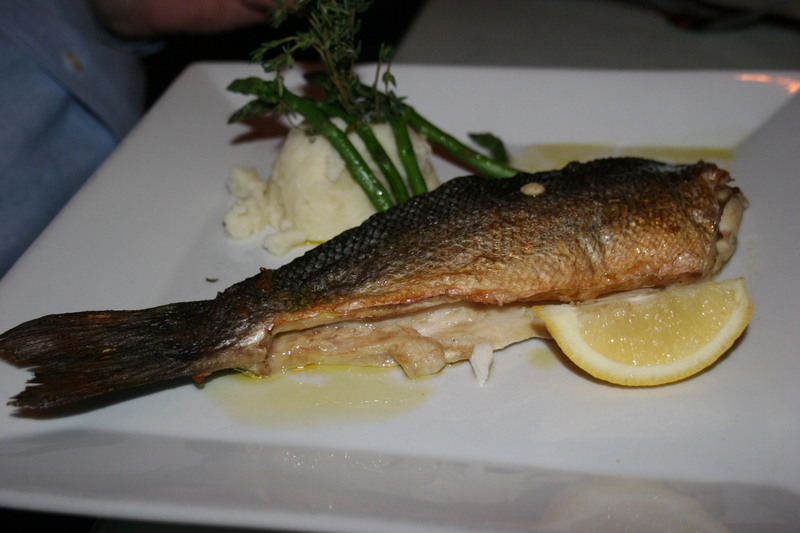 This wasn’t a major complaint but it would have been nice if the entire meal matched the warmth and charm displayed by our server, Frankie Fish. 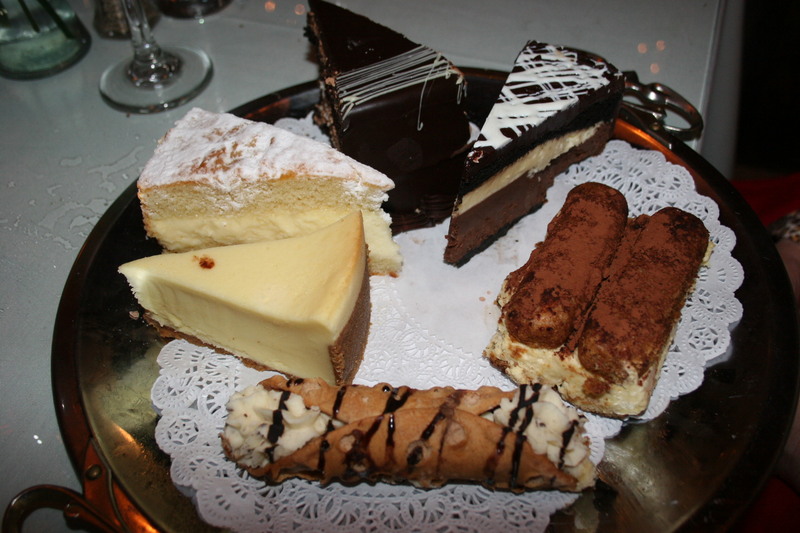 The tray of fresh desserts looked terrific and I know we sampled almost all of them. By this time we were in a bit of a rush as we had show tickets and the start time was quickly approaching. Overall, it was quite a fun night. 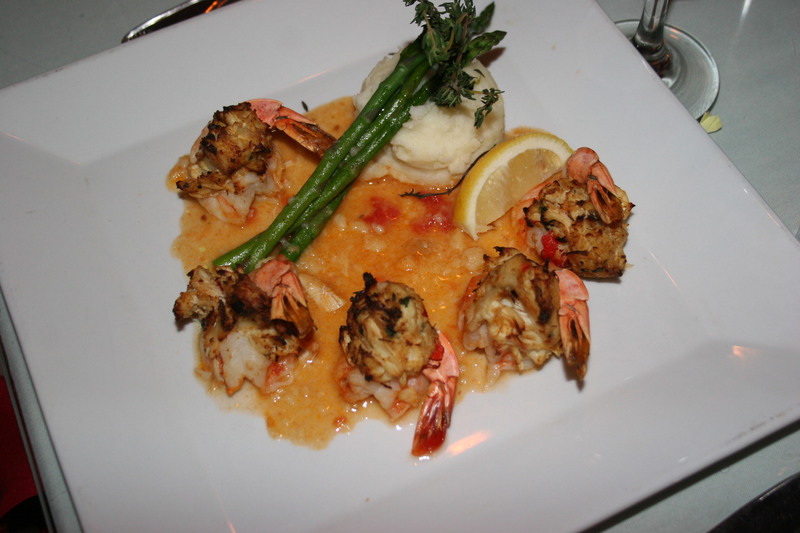 The food was good and the service was top-notch. 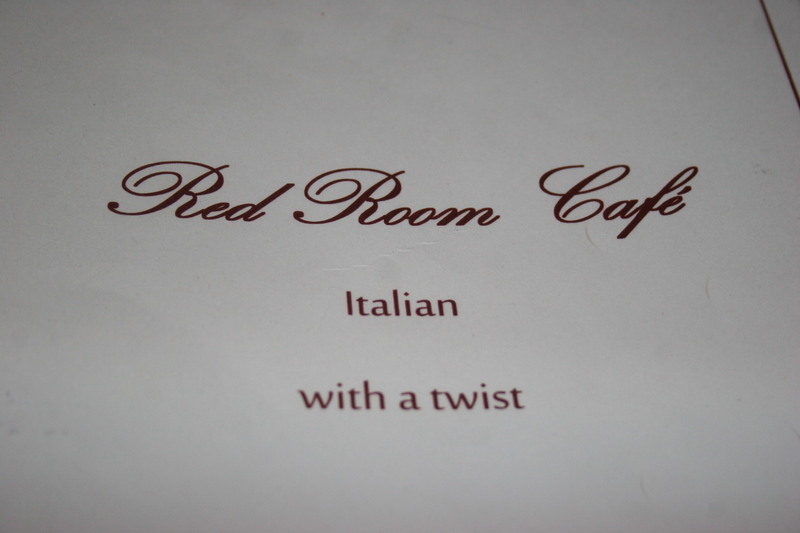 I would strongly suggest adding The Red Room Cafe in Ventnor to your list of BYOBs to visit during your trips to the Jersey shore this summer.